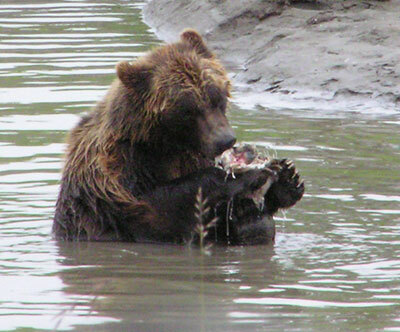 Wildlife wasn’t quite as plentiful as the Alaskan zealots would have you believe. I’m sure there was wildlife out there; we just didn’t see any without driving to a refuge. However, we did pass a road sign which bluntly stated that 173 moose had been hit by cars in the past year. 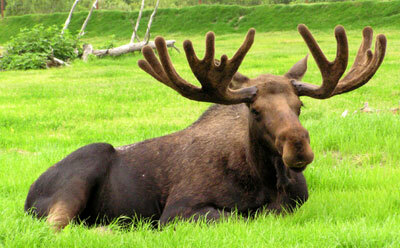 With a moose being hit every other day, perhaps that’s why there weren’t more posing for the camera-toting tourists. All of these animals are rescue animals, now living in a wildlife preserve. 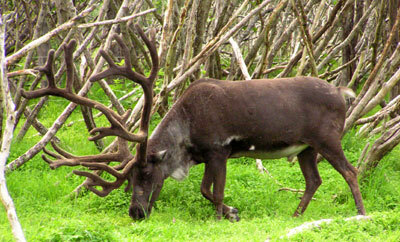 As such, all are indigenous to the area, such as this caribou. The bears were great. 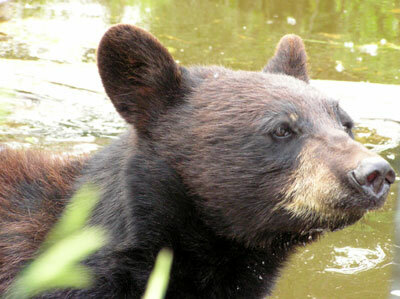 The first is one of a pair of black bear cubs they had. The cubs were very playful and wrestled constantly, in and out of the water. Great fun to watch. There was a lone grizzly bear as well. He seemed to be having quite a time playing with the remainder of some large fish. When not gnawing on it, he would toss it into the air and forcefully bat it down into the water. He then would search frantically in the water for the fish and once it had been reclaimed would repeat the process. It looked to me like he dearly wanted to hunt. 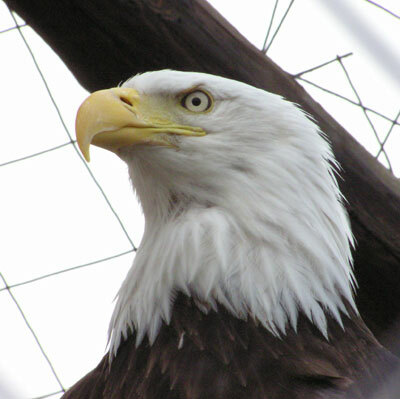 The one non-domestic / non-food item animal we did see in the wild happened to be a bald eagle. Unfortunately, at the time my camera was safely stowed away in the trunk of the car. But there was no mistaking the majestic predator as he silently glided over our car. The preserve happened to have a bald eagle as well, though one must wonder how he ended up there. I sat down at my desk to begin studying, and suddenly realized I was browsing through your blog. Nice format, nice pictures, interesting thoughts. A human-centered facility for publicly showing ecology under the pretense of preservation, where many captured birds, beasts, fish, and insects are forced to live in a small area, and kept until they die. This is from the 4th edition of the Shinmeikai Dictionary of Japanese (新明解国語辞典). I do not have my copy with me, and relied on this web site, http://www.geocities.co.jp/Bookend-Soseki/3578/miryoku.htm, for the definition. This is no joke — this dictionary contains many such definitions, and because of the prominence of the publisher and nominal editor, is the most widely-used concise dictionary used in Japan. There are actually many websites dedicated to sharing the joys of reading this dictionary (yes, reading), but I believe there are still no English-language websites on the subject. When I set up my own blog, please look forward to my comments on lexicography:Shinmeikai.